I'd like to follow up my earlier post, analyzing which browsers Greasemonkey is used in. 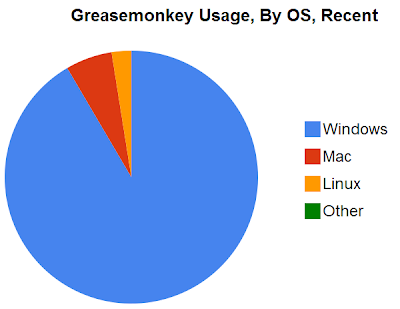 This time, a view on the operating systems where Greasemonkey is used. This is generally less interesting information -- it closely mirrors the market share of the OSes. But it's one more bit of detail we can derive from the AMO stats. Like I said at the beginning, generally the breakdown of the operating systems in general. Even so, the eight or nine percent of users on Mac or Linux make up nearly a quarter of a million users. Like before, the numbers and charts are visible on Google Docs. No script this time, the work was easy enough to do by hand. Greasemonkey Mafia wars has stopped working since last Zynge change. Can't find necessary jobs for junk posts. Is there an update to fix this? If so , please let me know, thanks. It's a fantastic tool. How did you measure usage? I get greasemonkey from my distribution's package manager so if you measure it by downloads from the add-ons page then you are missing some info.